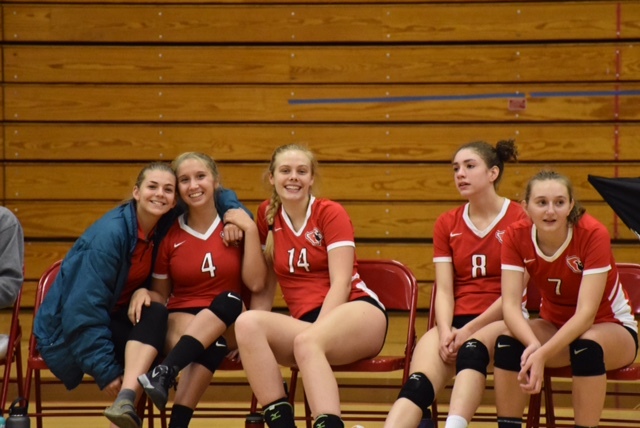 From left, volleyball teammates Libby Lazzara and Anthea Fraser. With a new lifestyle on the horizon, seniors are preparing for the next steps of their lives. Some seniors, like Libby Lazzara, are choosing to go on to college for athletics and others, like Anthea Fraser, are going for pure academics. Some may not be going to college at all and are taking advantage of traveling abroad or getting a head start in a job. To go to college for athletics, there is a complicated pathway to complete in order to commit. The process goes through many different steps until senior year. Lazzara committed to Colorado College for volleyball. She said she secured her spot in February, even though in some situations the process goes all the way until August. After visiting the college, it immediately became Lazzara’s first choice. She was allowed to interact with people on campus, went to class, met students and knew that Colorado College was the right school for her. Currently, Lazzara is trying not to slack, and finish strong through the end of senior year. On May 1, Fraser announced she will be attending University of Portland. “Being in the final weeks of IB classes and taking finals, stress levels are incredibly high,” states Fraser. The pressure adds up as colleges who have already admitted students watch to make sure students’ progress does not decrease. Overall, Fraser and Lazzara are having great senior years. “Being able to take the classes you like and not just the requirements makes me love my classes,” Fraser said. Nice information shared by you and thanks for sharing this useful information with us“Sheep Heritage Foundation Memorial Scholarship”. The scholarship is for the advancement of the sheep industry, lamb, and wool, through financial support of a graduate-level (MS or Ph.D.) student who is attending a school in the U.S.